GAF is the official film of Yesterland. The long relationship between Eastman Kodak and Disneyland was interrupted in the 1970s when GAF was the Official Film of Disneyland and in the early 1980s when it was Polaroid. Then, for almost three decades, Kodak was back. Main Street Photo Supply Company presented by Kodak was in the space that was once the INA Carefree Corner. There is no longer an Official Film, but in 2013 Nikon became the Official Camera of Disneyland. 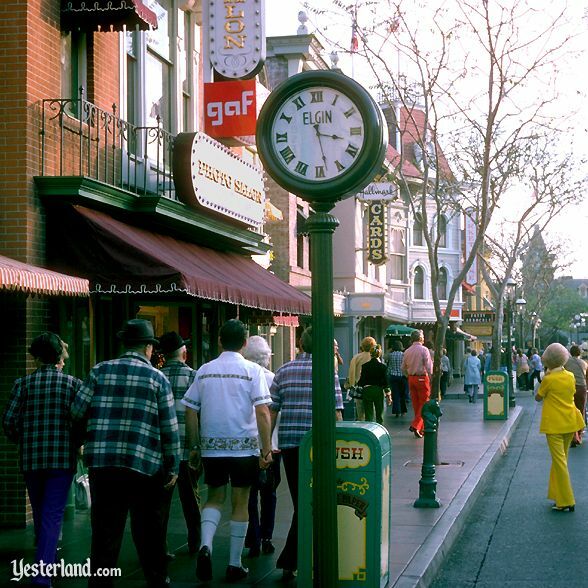 The timepieces sold on Main Street in Disneyland keep changing. Checking old Disneyland Souvenir Guidebooks from various years reveals: In 1969, it was Timex. In 1974, it was Elgin. In 1990, it was Lorus. The space previously occupied by the Hallmark Communication Center is now Disney Clothiers, Ltd. Photograph of Main Street by Werner Weiss, 1974.